We all love pickles here in our family. So much so that I planted multiple pickling cucumber bushes this year, and will definitely be making many jars of these lacto-fermented pickles. Lacto-fermentation is the natural-traditional process of “pickling” foods that creates the good for you bacteria, Probiotics, the ones that are so vital for overall good health. Did you know 80% of Your Immune System is in Your GI Tract? Eating some cultured “lacto-fermented” condiment everyday helps boost healthy gut flora. Make sure your jar is very clean. Wash cucumbers well and place in a bowl of ice cold water to cover. Meanwhile prepare the pickling liquid. Mix 1 cup filtered water, 4 Tablespoons whey, and 1 Tablespoon salt together until the salt dissolves. Mix in the dill and mustard seeds; set aside. Remove cucumbers from the ice water and cut into 1/4-inch slices. Place slices into jar, laying them as flat as possible. Fill the jar to 1-inch from the top to leave space for expansion. Pour the pickling liquid over the cucumber slices in the jar. 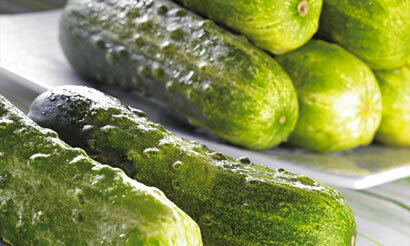 Add additional filtered water as needed to cover the cucumbers, leaving 1-inch space from the top of the jar. Place lid (preferably air-lock lid) on the jar tightly. If using air-lock fill with water according to instructions. Allow to ferment (culture) for 2 days at room temperature. Remove air-lock lid, if using, and replace with storage lid — transfer to cold storage. I fermented cucombers using whey from raw milk .. the whey (I believe the cause) made them smell bad (to me).. do you think something went wrong (the whey had a smell to start with) or I’m just not use to that smell.. if that’s the case, can I just omit the whey and still get probiotics?? Thank you in advance! Valerie, it does sound like something was off. I would suggest using whey that has been drained from yogurt that “contains live cultures”. OR you could take the easier route and eliminate the whey all together. To do this simply make a brine using 2 Tablespoons of Himalayan Salt and 4 cups of filtered water. Cover the cucumber slices with the brine and ferment as instructed in the recipe. I made lacto fermented pickles & after a week, put them in the fridge. I am making about a gallon more now & would love to know if I could store them in a cold room, instead for long-term storage. Refrigerator space is at a premium. 🙂 Thank you & thanks for a great article! Renee, in the past people used root cellars to store their fermented goods. The room would have to be very cool, like below 48 degrees. Remember lacto-fermented goods are not canned foods, they are still alive, keeping them cool just slows the fermentation process down. Do some home canning. Is this considered “processed’? I would think they are good for your body also. What am I “missing”? Karin, home canning is still technically “processed”. In home canning you boil everything and the food is considered dead. In lacto-fermenting the foods are usually kept raw and no heat is used. So in-turn the lacto-fermented foods are alive with enzymes and probiotics that nurture the body. As we approach pickling season, I only have made refrigerator pickles, with vinegar, sugar and salt and some seasoning/spices. Can onions and garlic be added? If so, at what stage? It doesn’t need any vinegar at all? Thanks! Yes onions and garlic can be added if desired, at the beginning with everything else. These pickles are different from refrigerator pickles in that that are “cultured”…. 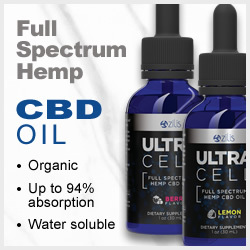 think of them as “probiotic” pickles – live in beneficial enzymes and helpful bacteria needed for a strong immune system and overall good health. 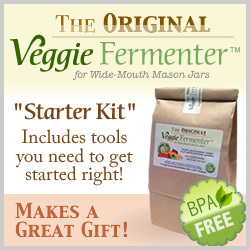 Being new to lacto-fermentation I would suggest our Lacto-fermentation Kit, which includes everything you need to get started (minus a jar and some vegetables that you supply 🙂 ). The lacto-fermenting book contains several chapters on lacto-fermentation, including why/how, methods, history, safety, and over 40+ easy to follow recipes. The air-lock system works with all wide-mouth mason-type canning jars (Ball & Kerr) and makes the tastiest lacto-feremented foods ever. Can you use vegetable culture instead of whey? There are many vegetable starter cultures out there. But I have not personally used any of them. It is just a personal preference really. I feel that I do not need them, that is all. My ferments come out great without a vegetable culture. If you choose to use one then you’ll need to follow the instructions included with it. Can the pickle slices be made as spears instead? Yes they can be made into spears instead of slices. This may cause them to take longer to ferment by about 1 day. After these are fermented, do they have to stay in the frig or is there a way to seal them? I tried to make a gingered carrot batch with a vegetable master jar and it molded. I guess my big question is how do you store big batches of fermented foods? Ferments need to be placed in cold storage to stop the fermenting process. Since I don’t have a root cellar, for me cold storage is the fridge. And in my experience, not all ferments will keep as long as others. If kept at the right temp. Sauerkraut will keep about a year, Salsas a month or two, and things like Beet Kvass should be made on an as needed basis. And since lacto-ferments should be eaten as condiments/sides, I never make a really large batch….sometimes I will make a half gallon of sauerkraut at a time, but otherwise it’s smaller batches. I have the fermented green beans going on my counter right now. Can’t wait to see how they turn out! Awesome! The fermented green beans really are delicious…can’t help but munch on them constantly when they’re around.